Following a unanimous decision by show of hands at our AGM on 10.11.08 we are now officially an 'Informal Group' of the CTC. No change as far as membership benefits and cycling is concerned. Just less bureaucracy. We are still part of Manchester DA (now known as Manchester & District CTC), but the Section now exists only to hold rides - there is no need for formal meetings or Annual General Meetings. We will be continuing with our quarterly evening meetings at the Trackside for compiling the runs lists, discussing cycling issues and for general socialising. Here's one for Brian Richards and Terry Hodges. This classic ad turned up recently. 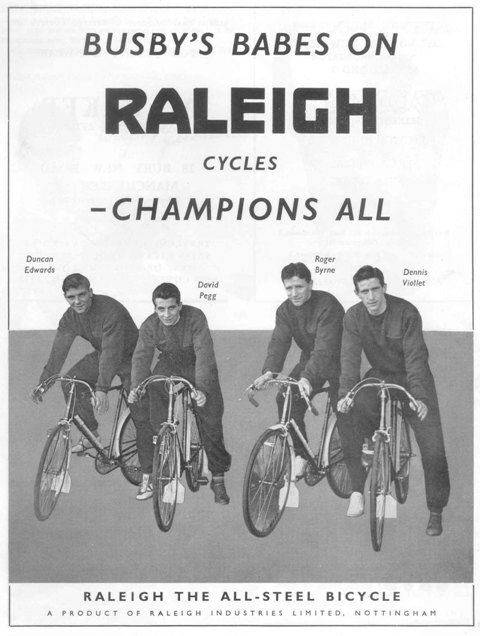 Can you imagine Rooney et al promoting cycles? We were in North Wales in 2008, based at Betwys-y-Coed Youth Hostel. Numbers were down on usual and unfortunately we do not have a report to post. Our fifth annual Cycling Quiz on Wed 22 Feb was somewhat of a damp squib as only two teams bothered to turn up. 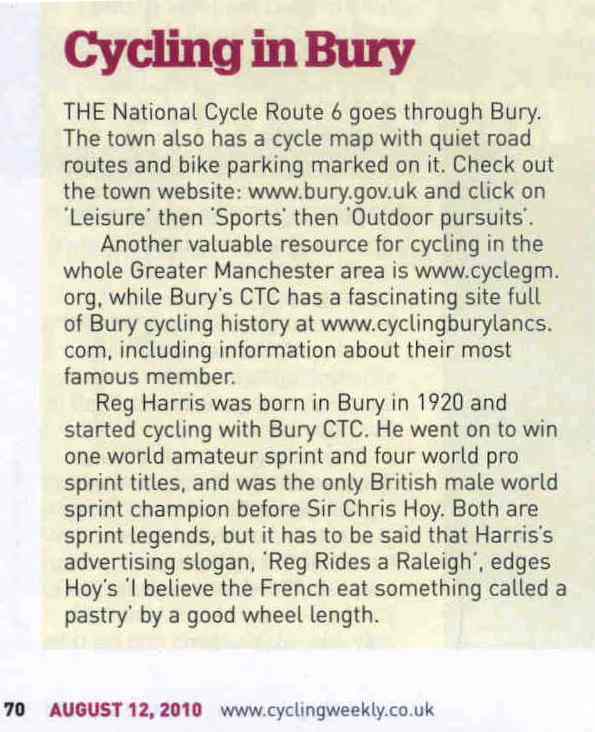 Thanks must be extended to Bury Cycle Speedway and five Bury CTC members for making the effort. This meant a head-to-head between the two teams with Bury CTC (aka Birtle Wheelers) taking the prize and certificate. Due to diminishing support and general apathy, this has been the final Cycling Quiz. The winner is Nick Walker of Bury. Ride Manchester is a not-for-profit group that exists to remove bikes from the waste stream, recycle them in our workshop, and redistribute them to people who will use them. We also share bicycle maintenance skills in workshops with youth and community groups. Our motivation is both environmental, and social - we want to inspire people to take back control of their means of getting around the City of Manchester. This email has been sent to all people that we thought might be interested in our project or working with us in some way. We have lots to offer, from affordable bikes, spares and repairs, to an earn-a-bike scheme whereby a person can volunteer in our workshop for a certian amount of time and get a fully working bike in return, and we can run bicycle maintenance workshops in your youth or community centre or with your group. Also, if you have any old bikes collecting dust in your shed, or even any bits of bikes, or know anyone who has, please contact us and we'll try our hardest to collect it off you, repair it and pass it on to someone who needs it! The workshop address is: 2b Buckhurst Road Levenshulme Manchester M19 3PL. It's just off Albert Road, very near the Train Station and the 192 Bus route (Stockport Road). Many members attended a farewell celebration on Friday 15th July at the Church Inn, Birtle for Andy Agnelli and Bev Swindells who have since started their new life in Italy. All club members wish them good luck. The couple were presented with a framed picture of a view from the top of the Rake showing Holcombe village and Peel Tower. They were also presented with a card signed by everyone present. Our 'B' section have returned from a camping holiday visiting Andy and Bev and cycling with them on the roads south of Genoa. We await a report for these pages. 'Birtle Wheelers' Champions! See Cycling Quiz page for a report on this year's event and the poster for the 2006 edition.